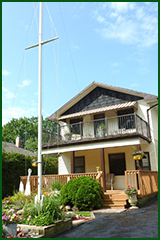 Your hosts, Greg and Rosemary welcome you to our B&B, located in the beautiful Pickering Beach area of Ajax, along the Crombie Waterfront Trail. Stroll along the lake, visit some local attractions, birdwatch, read in the screened gazebo, or just relax in the garden. We are located just 45 minutes from downtown Toronto. The home is new, custom built and air conditioned. It overlooks the provincially significant Carruthers Creek Wetland Complex.